FILE - Former Republican presidential nominee Mitt Romney during a campaign rally, Aug. 24, 2018, in Lehi, Utah. In a Washington Post essay published on Tuesday evening, Romney criticized a number of Trump's actions in December. "The appointment of senior persons of lesser experience, the abandonment of allies who fight beside us, and the president's thoughtless claim that America has long been a 'sucker' in world affairs all defined his presidency down," he wrote. He added that "Trump's words and actions have caused dismay around the world." FILE - President Donald Trump speaks during a signing ceremony in the South Court Auditorium of the Eisenhower Executive Office Building, on the White House complex, Dec. 20, 2018, in Washington. Romney suggested that "on balance, (Trump's) conduct over the past two years ... is evidence that the president has not risen to the mantle of the office." Romney is staking out an independent position two days before he takes office on Thursday. 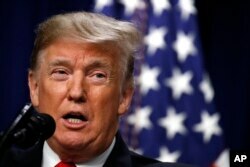 It is unclear whether Trump will face a serious challenge in 2020 to securing the Republican Party's presidential nomination. Trump last February endorsed Romney's run for a Senate seat in Utah. During the 2016 presidential campaign, Romney excoriated Trump as a "fraud" who was "playing the American public for suckers." Trump responded that Romney had "choked like a dog" in his unsuccessful 2012 campaign against Democratic President Barack Obama. Despite Romney's prior criticism, after Trump won the presidency in November 2016, he briefly considered tapping Romney as secretary of state. In his essay on Tuesday, Romney said he "will speak out against significant statements or actions that are divisive, racist, sexist, anti-immigrant, dishonest or destructive to democratic institutions." Romney has strongly defended press freedom and challenged Trump's repeated attacks on some news outlets as an "enemy of the people." "The media is essential to our Republic, to our freedom, to the cause of freedom abroad, and to our national security. It is very much our friend," Romney wrote in an essay in November.